Many who live outside the Asian region often get confused by the variety of ways that Chinese stations ID. Here is a brief guide of the most common ID phrases that mainland stations use these days. For more information on the topic, I highly suggest checking out Mika Mäkeläinen's page "How to Identify Chinese Radio Stations," which consists of a great deal of beneficial information on the topic. This is what you'll hear most often for IDs these days. Chinese stations have a format for IDing and telling listeners the time (top of the hour nearly required, half-hour ID optional), but many stations these days really don't care much about the government rules and shorten their IDs and tell their time their own way. a.) On AM 1260, a repeater of Liaoning's 1089 frequency, an example of two terms we'll cover today, both guangbo and dianshitai. "您现在收听的是 辽宁综合广播 (辽宁综合广播) AM 1089 FM 102.9, 辽宁广播电视台第一套广播节目, 新闻综合频率"
"Nin xianzai shouting de shi Liaoning zonghe guangbo (Liaoning zonghe guangbo), AM 1089 FM 102.9, Liaoning guangbo dianshitai di yi tao guangbo jiemu: xinwen zonghe pinlu." Translation: "You are now listening to Liaoning Comprehensive Radio (Liaoning Comprehensive Radio), AM 1089 FM 102.9, the 1st radio channel of Liaoning Radio and Television: News and Comprehensive Radio." * Dianshitai, further described below, is the word for a radio and television broadcasting group. b.) On AM 1305, we have both the second example of the very common "guangbo" and the phrase "You are listening to..." outlined both above and below in green. "厚德点亮生活, 幸福, 健康, 快乐. 您正在收听的是济南文艺广播 (济南文艺广播)." "Hou de dian liang shenghou, xingfu, jiankang, kuaile. Nin zhengzai shouting de shi Jinan wenyi guangbo (Jinan wenyi guangbo)." Translation: "Profound virtue lights up life; a blissful life, health, happiness. You are now listening to Jinan Literature Radio (Jinan Literature Radio)." c.) On AM 1395, a bilingual ID sure as heck solves your problems, but let's take a listen anyway! "北京时间22点整. 让平凡的生活拥有精彩的故事. FM107.4, 安徽故事广播, (Anhui Story Radio, 107-point-4 FM)... 整点故事." "Beijing shijian 22 dian zheng. Rang pingfan de shenghou yongyou jingcai de gushi. FM 107.4, Anhui gushi guangbo, (Anhui Story Radio, 107-point-4 FM)... Zheng dian gushi." Translation: "Beijing time is now 10 o'clock. Make the ordinary life have a wonderful story. FM 107.4, Anhui Story Radio," (in English: "Anhui Story Radio, 107-point-4 FM.")... Top-of-the-hour story." 2. "renmin guangbo diantai / 人民广播电台"
This is the long form of an official Chinese ID, also officially translated as "People's Radio". The stations that really follow the party rules run these IDs, which are more of the "traditional" IDs which are getting less common these days. This says the official name of the broadcasting station or group. Oftentimes, they will add which specific station it is after that. For example, "Shandong renmin guangbo diantai, xinwen guangbo" with the first part meaning that it's Shandong's broadcasting group, the second part meaning "news radio". The noise in the signal is 1566 Pyongyang. On AM 1566: One example can be found here with Yanbian People's Radio on 1053 and 1566. The noise in the signal is 1566 in Pyongyang. "Zhengjie gancui, meili Yanbian! Huanying shouting Yanbian renmin guangbo diantai." Translation: "Clean and simple, charming Yanbian! Welcome to listening to Yanbian People's Radio." 3. "guangbo dianshitai / 广播电视台"
"Guangbo dianshitai" is "radio and television" combined. This indicates that the group of stations is owned by a company that runs both radio and TV. While many do, the actual name of the company includes "Radio and Television," thus it is mentioned as such. In the case below, "Liaoning Radio and Television" is the company that owns the station. Rural Radio (xiangcun guangbo) is the station's name, which comes after the owning group in the ID. On AM 927: "辽宁广播电视台乡村广播大地之声, 全省AM927, 沈阳 FM89.5, 96.9, 铁岭 AM810，锦州 FM101.1, 葫芦岛 FM103.5..."
"Liaoning guangbo dianshitai, xiangcun guangbo. Dadi zhi sheng. Quan sheng AM 927. Shenyang FM 89.5, 96.9. Tieling AM 810. Jinzhou FM 101.1. Huludao FM 103.5..."
Translation: "Liaoning Radio and Television, Rural Radio. Voice of the land. Province-wide AM 927. Shenyang FM 89.5, 96.9. Tieling AM 810. Jinzhou FM 101.1. Huludao FM 103.5..."
Some stations just ID with "tai," meaning "station". In this case, it basically means "story station" or we'd translate it as "story radio". This is the half-hour ID on 1143 with 1143 Pyongyang behind it. This station says their ID in their own way and most stations using "tai" seem to have unique IDs. On AM 1143: "这里是中波1143千赫, 吉林市故事台. 有故事的人听有故事的广播." "Zheli shi zhong bo 1143 qian he, Jilin-shi gushi tai. You gushi de ren ting, you gushi de guangbo..."
Translation: "This is AM 1143, Jilin City Story Radio. There are stories of people listening to the radio..."
5. "dianshi zong tai / 电视总台"
Here's another variant of "guangbo dianshitai". Both essentially mean the same thing, but they're not the same words. On AM 1206: "北京时间2点整 听天下故事, 品百味人生, 江苏省广播电视总台 AM1206, 江苏故事广播... 每时每刻都有故事"
"Beijing shijian 2 dian zheng. Ting tianxia gushi, pin baiwei rensheng... Jiangsu sheng guangbo dianshi zong tai AM 1206, Jiangsu gushi guangbo... mei shi mei ke dou you gushi." Translation: "Beijing time now is 2 a.m. Listen to the story of the world, the taste of life. Jiangsu Province Radio and Television Station, AM 1206, Jiangsu Story Radio... Every moment has a story." 6. "zhi sheng / 之声"
Some province-wide networks will use "zhi sheng," i.e. "Voice of," or if it's a music station, I'd translate it as "Sound of" instead. 810 in Zhejiang is one of these. CNR propaganda blasters, such as those near Taiwan, also use these station names and that actually includes almost every CNR network. The "Voice of" part comes at the end, so it would translate as "Zhejiang, Voice of". These stations seem to be notorious for their own IDs. 810 has their own time pips that only they have, while AM 1476 IDs with a jingle almost every time, but doesn't use the typical words to identify themselves, which could and does throw off many foreign listeners, myself included. On AM 1476: "在北方, 更温暖. FM103.5 北大荒之声, 龙广精品调频. (Station jingle: 北大荒之声, 你就是他的方向)." "Zai beifang, geng wennuan. FM 103.5 Beida huang zhi sheng, longguang jingpin tiaopin." (Station jingle: Beida huang zhi sheng, ni jiushi ta de fangxiang)." Translation: "In the north, it's warmer. FM 103.5 Sound of the Great Northern Wilderness, Longguang (the Heilongjiang broadcasting group's name) Luxury Goods FM. (Station jingle: Sound of the Great Northern Wilderness, you are his direction)." Much thanks to my friend Jingshen Liu / 刘敬深 for his help in translating everything between the station IDs here. 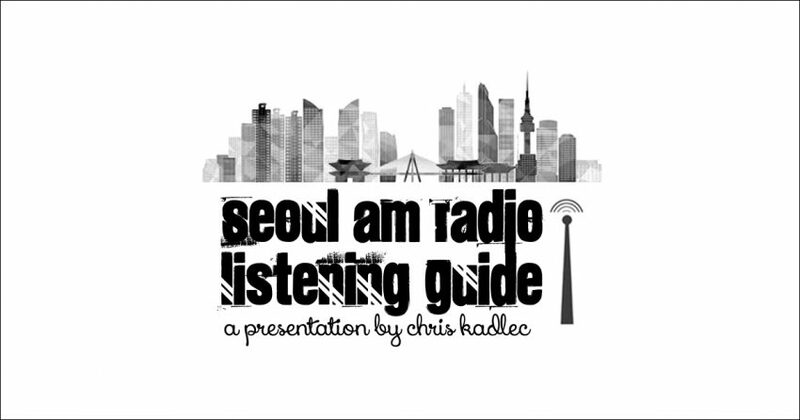 Jingshen also assisted me with the Seoul AM Radio Listening Guide and my Chinese FM project of my Songtan FM Radio Log in the past. Without his help, projects like these wouldn't exist.